Posted on January 23, 2017 at 10:29 am. Locals can now legally gamble at Vietnamese casinos, provided they earn over $AUD500 a month. Locals will be able to enter and gamble at Vietnam casinos provided they earn $500 a month. 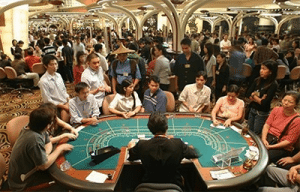 The casino gambling market which is thriving due to foreigners will now be accessed by residents of Vietnam, following the government’s move to trial a gambling scheme accessible by locals. The decree will be effective as of March 15, and provided the Vietnamese locals meet the eligibility criteria, they will be able to enter and gamble at the casino. Casinos have long been illegal for locals, but are legal for foreigners with around 25 land-based casinos available in the country for visitors who show their passport. The criteria set out by the government says residents who are over 21 with a monthly income of at least 10 million dong (almost $AUD584) per month, can wager at brick and mortar gambling venues under a three-year pilot program. While this doesn’t sound like much, it is considered to be a substantial salary in Vietnam, with the average wage earned by Vietnamese estimated to be around $AUD186 per month. Vietnamese will also have to pay one million dong (around $AUD58) a day or 25 million dong ($AUD1400) a month to enter. If any family members, including biological and adopted parents and children, formally request the casino to exclude the Vietnam resident from entering, a ban will be placed on the person. Many Vietnamese are quite keen on the idea, despite the current ban on most forms of betting, causing locals to engage in illegal gambling such as purchasing prohibited lottery tickets, betting on buffalo fights and wagering large sums of money on football matches. This is despite the hefty fines and severe prison sentences incurred if found engaging in this illegal activity. As a result, the government is said to be losing hundreds of millions of dollars in potential tax revenue, which is perhaps why this scheme is being introduced. In order to accept Vietnamese locals, casinos are required to be part of an entertainment and hotel complex, with the investment capital of at least $AUD2.5 billion. The legislation will face a review after three years to determine if it will become a permanent change in the law. This trial has also seen the delay of pokies being installed at airports, exclusively available to international visitors. This decision will be reassessed following the trial, and provided the three-year scheme is a success they may be installed for both international visitors and Vietnamese locals to play. Can Vietnamese citizens play at online casinos? Current Vietnamese gambling legislation classifies all forms of online betting as illegal. Hundreds of foreign websites were blocked by the government since 2012, but it has not deterred many locals from playing at other offshore online casino sites or using VPN (Virtual Private Network) services to circumvent the geo-blocking. Despite the popularity, the Vietnamese dong (VND) is not a widely accepted currency at any online casino, so Vietnamese players who choose to continue playing at overseas casino sites have to convert their currency into EUR or USD. If you are from Vietnam and wish to gamble at online casinos, even at sites which are licensed and regulated in trusted jurisdictions, you do so at your own risk.